Aim: A scheme for understanding how the human body organizes postural movements while performing Vrikshasana is developed in the format of this paper. Settings and Design: The structural characteristics of the body and the geometry of the muscular actions are incorporated into a graphical representation of the human movement mechanics in the frontal plane. A series of neural organizational hypotheses enables us to understand the mechanics behind the hip and ankle strategy: (1) Body sway in the mediolateral direction; and (2) influence of hip and ankle to correct instabilities caused in body while performing Vrikshasana. Materials and Methods: A methodological study on 10 participants was performed by mounting four inertial measurement units on the surface of the trapezius, thoracolumbar fascia, vastus lateralis, and gastrocnemius muscles. The kinematic accelerations of three mutually exclusive trials were recorded for a period of 30 s. Results: The results of every trial were processed using two different approaches namely statistical signal processing (variance and cross-correlation). Conclusions obtained from both these studies were in favor of the initial hypothesis. Conclusions: This study enabled us to understand the role of hip abductors and adductors, and ankle extensions and flexions in correcting the posture while performing Vrikshasana. Objectives: To measure the effect of the right and left nostril yoga breathing on frontal hemodynamic responses in 32 right handed healthy male subjects within the age range of 18–35 years (23.75 ± 4.14 years). Materials and Methods: Each subject practiced right nostril yoga breathing (RNYB), left nostril yoga breathing (LNYB) or breath awareness (BA) (as control) for 10 min at the same time of the day for three consecutive days, respectively. The sequence of intervention was assigned randomly. The frontal hemodynamic response in terms of changes in the oxygenated hemoglobin (oxyHb), deoxygenated hemoglobin (deoxyHb), and total hemoglobin (totalHb or blood volume) concentration was tapped for 5 min before (pre) and 10 min during the breathing practices using a 16 channel functional near-infrared system (FNIR100-ACK-W, BIOPAC Systems, Inc., U.S.A.). Average of the eight channels on each side (right and left frontals) was obtained for the two sessions (pre and during). Data was analyzed using SPSS version 10.0 through paired and independent samples t-test. 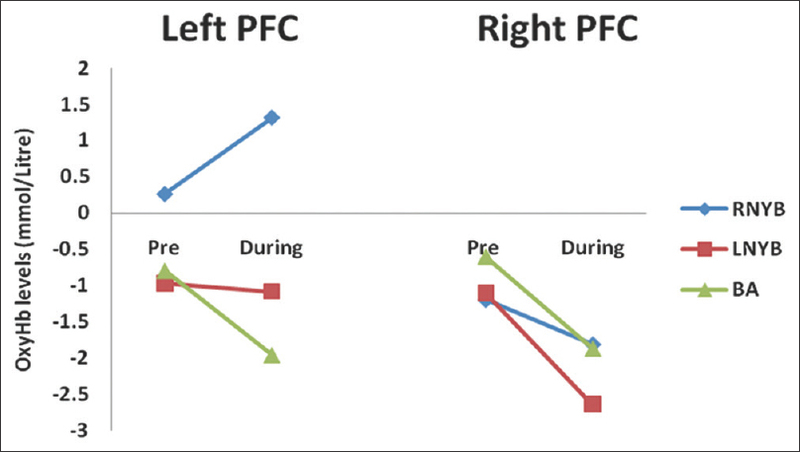 Results: Within group comparison showed that during RNYB, oxyHb levels increased significantly in the left prefrontal cortex (PFC) as compared to the baseline (P = 0.026). LNYB showed a trend towards significance for reduction in oxyHb in the right hemisphere (P = 0.057). Whereas BA caused significant reduction in deoxyHb (P = 0.023) in the left hemisphere.Between groups comparison revealed that oxyHb and blood volume in the left PFC increased significantly during RNYB as compared to BA (oxyHb: P =0.012; TotalHb: P =0.017) and LNYB (oxyHb: P =0.024; totalHb: P =0.034). Conclusion: RNYB increased oxygenation and blood volume in the left PFC as compared to BA and LNYB. This supports the relationship between nasal cycle and ultradian rhythm of cerebral dominance and suggests a possible application of uninostril yoga breathing in the management of psychopathological states which show lateralized cerebral dysfunctions. Background: While efficacy of Sudarshan Kriya Yoga (SKY) has been demonstrated in a number of prior studies, little is known about the effects of SKY taught as part of the Your Enlightened Side (YES+) workshop designed for college students and other young adults. Aims: This study aimed to assess the effects of YES+, a yogic breathing-based life skills workshop, on multiple measures of well-being and physiological stress response. Materials and Methods: Two nonrandomized open-trial pilot studies were conducted with a total of 74 young adults (age 25.4 ± 6.6 years; 55% female). Study 1 collected a variety of self-report questionnaires at baseline, postworkshop, and 1-month follow-up. Study 2 collected self-report questionnaires in addition to electrocardiography with a stationary cycling challenge at baseline and 1-month follow-up. Results: Study 1: Improvements in self-reported depression (P's ≤ 0.010), perceived stress (P's ≤ 0.002), life satisfaction (P's ≤ 0.002), social connectedness (P's ≤ 0.004), and gratitude (P's ≤ 0.090) were observed at postworkshop and 1-month after workshop relative to baseline. Study 2: Improvements in self-reported emotion regulation were observed at 1-month follow-up relative to baseline (P = 0.019). Positive and Negative Affect Schedule-Expanded Form positive affect increased (P = 0.021), while fatigue and sadness decreased (P's ≤ 0.005). 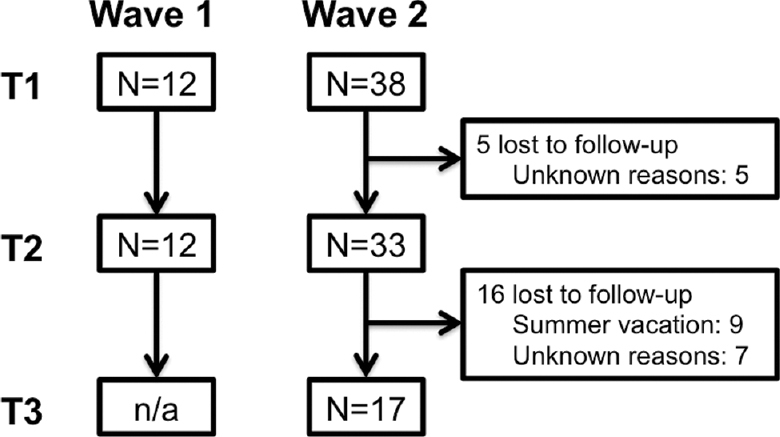 During the stationary cycling challenge, rate to recovery of electrocardiography inter-beat interval also increased from baseline to 1-month follow-up (P = 0.077). Conclusions: These findings suggest that a life skills workshop integrating yogic breathing techniques may provide self-empowering tools for enhancing well-being in young adults. Future research is indicated to further explore these effects, particularly in regards to vagal tone and other aspects of stress physiology. Background: With clearer evidence of its benefits, coaches, and athletes may better see that yoga has a role in optimizing performance. Aims: To determine the impact of yoga on male college athletes (N = 26). 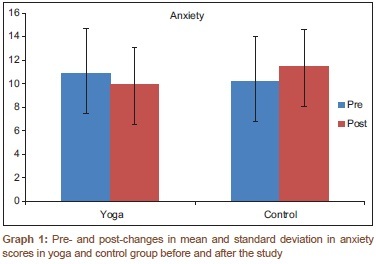 Methods: Over a 10-week period, a yoga group (YG) of athletes (n = 14) took part in biweekly yoga sessions; while a nonyoga group (NYG) of athletes (n = 12) took part in no additional yoga activity. Performance measures were obtained immediately before and after this period. Measurements of flexibility and balance, included: Sit-reach (SR), shoulder flexibility (SF), and stork stand (SS); dynamic measurements consisted of joint angles (JA) measured during the performance of three distinct yoga positions (downward dog [DD]; right foot lunge [RFL]; chair [C]). Results: Significant gains were observed in the YG for flexibility (SR, P = 0.01; SF, P = 0.03), and balance (SS, P = 0.05). No significant differences were observed in the NYG for flexibility and balance. 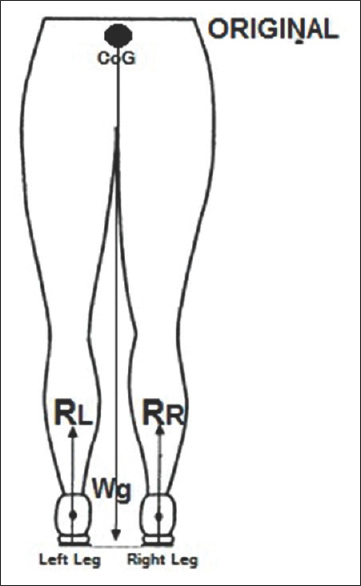 Significantly, greater JA were observed in the YG for: RFL (dorsiflexion, l-ankle; P = 0.04), DD (extension, r-knee, P = 0.04; r-hip; P = 0.01; flexion, r-shoulder; P = 0.01) and C (flexion, r-knee; P = 0.01). Significant JA differences were observed in the NYG for: DD (flexion, r-knee, P = 0.01: r-hip, P = 0.05; r-shoulder, P = 0.03) and C (flexion r-knee, P = 0.01; extension, r-shoulder; P = 0.05). A between group comparison revealed the significant differences for: RFL (l-ankle; P = 0.01), DD (r-knee, P = 0.01; r-hip; P = 0.01), and C (r-shoulder, P = 0.02). Conclusions: Results suggest that a regular yoga practice may increase the flexibility and balance as well as whole body measures of male college athletes and therefore, may enhance athletic performances that require these characteristics. Background: The beneficial aspect of positive emotions on the process of learning and the harmful affect of negative emotions on coping with stress and health are well-documented through studies. The Home Guards (HGs) are working in a very stressful situation during election, managing traffic and other crowded places. It is quite essential in present day circumstances that they have to manage their emotions and cope up with different stressful situations. Objective: To study the efficacy of integrated Yoga module (IYM) on emotions (positive and negative affect [PA and NA]) of HGs. Methods: A total of 148 HGs both males and females who qualified the inclusion and exclusion criteria were randomly divided into Yoga group (YG) and control groups (CG). The YG had supervised practice sessions (by trained experts) for 1 h daily, 6 days a week for 8 weeks along with their regular routine work whereas CG performing their routine work. Positive affect negative affect scale (PANAS) was assessed before and after 8 weeks using a modified version of PANAS. Results: PA in YG had significantly increased (P < 0.05) whereas it had decreased significantly (P < 0.05) in CG. Other positive effect in YG had significantly increased (P < 0.001), whereas it had decreased significantly (P < 0.001) in CG. NA in YG had significantly decreased (P < 0.001), whereas it had significantly increased (P < 0.001) in CG. Other NA in YG had significantly decreased (P < 0.001), whereas it had significantly increased (P < 0.01) in CG. Conclusions: The results suggested that IYM can be useful for HGs to improve the PA and to decrease NA score. Moreover, IYM is cost-effective and helps HGs for coping up with emotions in stressful situations. Background: Osteoporosis is commonly encountered by postmenopausal women. There is an increased need for a low cost and efficient treatment alternative to address this population. Aims: To study the effects of integrated yoga on bone mineral density (BMD) in postmenopausal women with osteoporosis. Settings and Designs: Experimental pre-post study conducted in a community setting. Materials and Methods: 30 females in the age group of 45–62 years suffering from postmenopausal osteoporosis with a dual-energy X-ray absorptiometry (DEXA) score of ≤−2.5 underwent a 6 months fully supervised yoga session. All the participants completed the study. Pretraining and posttraining BMD was calculated. Outcome measure: DEXA score at the lumbar spine. Statistical Analysis: The study was statistically analyzed using paired t-test to see the significance of pretraining and posttraining effects of a yoga session. Results: Improvement in T-score of DEXA scan of −2.55 ± 0.25 at posttraining as compared to a pretraining score of −2.69 ± 0.17. Conclusions: Integrated yoga is a safe mode of physical activity which includes weight bearing as well as not weight bearing asanas, Pranayama, and suryanamaskar, all of which helps induce improvement in BMD in postmenopausal osteoporotic females. Background: Electro photonic imaging (EPI) technique is growing as a novel technique of health assessment and is being utilized in the fields of alternative medicine, conventional practices, psycho-physiology, psychology, and consciousness studies. The existing EPI norms are based mostly on European (EU) population. In order to enhance the practice and research through EPI in India, there is a need for developing norms for the healthy Indian population. Objective: The objective of the study was to establish the normative data of EPI for the healthy Indian population, to aid in the accuracy of EPI measurements and interpretations. Materials and Methods: A total of 1297 volunteers were assessed once, who represented different parts of India during December 2013 to December 2014. Among them, 880 volunteers were reported to be healthy (age mean ± standard deviation [SD], 33.55 ± 10.92), with 584 males (age mean ± SD, 33.54 ± 10.86) and 296 females (age mean ± SD, 33.56 ± 11.00). In this study activation coefficient (stress level), integral area (IA) (general health), and integral entropy (disorderliness in energy) parameters were analyzed. Results: As the data were not normally distributed, quartile based statistics was used for setting the norms. The 25th and 75th percentiles were calculated and they were further verified using a bootstrap procedure. Uniquely, the results showed a clear difference in IA parameters under both with filter (physiological) and without filter (psycho-physiological) conditions between the Indian and the EU population. Though other parameters were found almost similar to the EU population, inter quartile ranges were narrower in the Indian population as compared to the EU values. Similar trends were observed in the subgroup analyzes: That is, male versus female genders and age ranges 18–40 versus 40-60. Conclusion: As compared to EU population, Indian population had different range of Integral Area values and narrower range for values of other variables. EPI Studies in India should also adjust for factors such as age and gender. Background: Human immunodeficiency virus (HIV) infected individuals frequently suffer from anxiety and depression. Depression has been associated with rapid decline in CD4 counts and worsened treatment outcomes in HIV-infected patients. Yoga has been used to reduce psychopathology and improve immunity. Aim: To study the effect of 1-month integrated yoga (IY) intervention on anxiety, depression, and CD4 counts in patients suffering from HIV-1 infection. 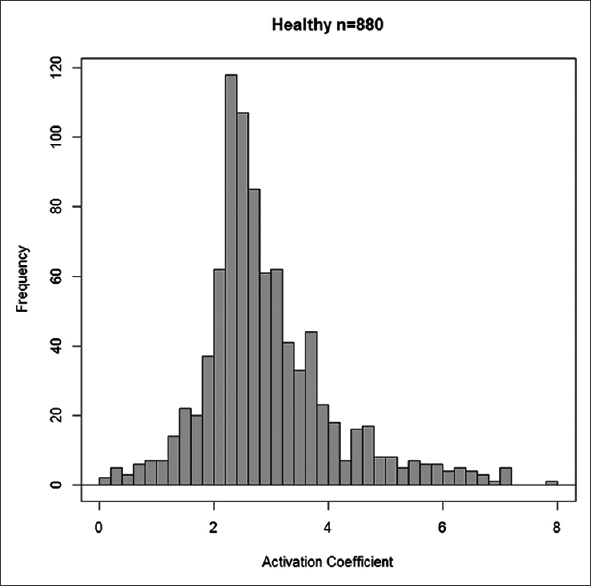 Methods: Forty four HIV-1 infected individuals from two HIV rehabilitation centers of Manipur State of India were randomized into two groups: Yoga (n = 22; 12 males) and control (n = 22; 14 males). Yoga group received IY intervention, which included physical postures (asanas), breathing practices (pranayama), relaxation techniques, and meditation. IY sessions were given 60 min/day, 6 days a week for 1 month. Control group followed daily routine during this period. All patients were on anti-retroviral therapy (ART) and dosages were kept stable during the study. There was no significant difference in age, gender, education, CD4 counts, and ART status between the two groups. Hospital anxiety and depression scale was used to assess anxiety and depression, CD4 counts were measured by flow cytometry before and after intervention. Analysis of variance – repeated measures was applied to analyze the data using SPSS version 10. Results: Within group comparison showed a significant reduction in depression scores (F [1, 21] =4.19, P < 0.05) and non-significant reduction in anxiety scores along with non significant increment in CD4 counts in the yoga group. In the control group, there was a non-significant increase in anxiety and depression scores and reduction in CD4 counts. Between-group comparison revealed a significant reduction in depression scores (F [1, 21] =5.64, P < 0.05) and significant increase in CD4 counts (F [1, 21] =5.35, P < 0.05) in the yoga group as compared to the control. Conclusion: One month practice of IY may reduce depression and improve immunity in HIV-1 infected adults. Background: Yoga is a science that facilitates homeostasis, an ancient way of life intended to improve the quality of life of an individual. Practice of yoga is proposed to alter the autonomic nervous system and affect the cardiovascular functioning. This study was intended to assess the influence of short-term practice of yoga for a month on heart rate variability (HRV). Materials and Methods: Totally, 40 healthy male volunteers in the age group of 30–60 years willing to practice yoga for a month were included in the study. HRV was assessed using HRV device (RMS Vagus, India). Preinterventional assessment of HRV was done in these subjects. Practice of yoga that included a set of physical postures (asanas), breathing techniques (pranayama), and meditation (dhyana) were performed for an hour daily for 1 month under the guidance of a certified yoga instructor. Postinterventional assessment of HRV was done. The values were expressed in median and their interquartile range, and statistical analysis was done to compare the changes using Wilcoxon Signed Rank Test. Results: Thirty-two of 40 subjects recruited for yoga practice completed the study protocol. Analysis of HRV revealed that in time domain parameters, SDNN increased from 33.60 (31.41–44.82) to 42.11 (34.43–57.51), RMSSD increased from 22.00 (16.00–33.80) to 25.6 (17.0–34.8), and PNN50 increased from 2.45 (0.80–15.38) to 7.35 (1.40–18.57) after intervention. In the frequency domain parameters, the low-frequency (LF) power spectrum reduced from 39.30 (25.1–46.25) to 30.40 (22.75–40.62) and LF/high-frequency ratio was reduced from 2.62 (1.91–4.07) to 2.28 (1.4–3.07) after 1 month practice of yoga. P < 0.05 was considered statistically significant. Conclusion: Autonomic balance tilts toward parasympathetic predominance after 1 month practice of yoga. 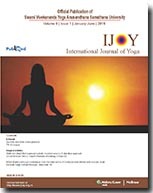 Background: Many yoga texts make reference to the importance of mental health and the use of specific techniques in the treatment of mental disorders. Different concepts utilized in modern psychology may not come with contemporary ideas, instead, they seem to share a common root with ancient wisdom. Aims: The goal of this perspective article is to correlate modern techniques used in psychology and psychiatry with yogic practices, in the treatment of mental disorders. Materials and Methods: The current article presented a dialogue between the yogic approach for the treatment of mental disorder and concepts used in modern psychology, such as meta-cognition, disidentification, deconditioning and interoceptive exposure. Conclusions: Contemplative research found out that modern interventions in psychology might not come from modern concepts after all, but share great similarity with ancient yogic knowledge, giving us the opportunity to integrate the psychological wisdom of both East and West. Aims: The present study focuses on analyzing the effects of Sudarshan Kriya yoga (SKY) on brain signals during a working memory (WM) task. To envision the significant effects of SKY on WM capacity (WMC), we chose a control group for contriving a cogent comparison that could be corroborated using statistical tests. Subjects and Methods: A total of 25 subjects were taken in the study, of which 10 were allotted to a control group and 15 to an experimental group. Electroencephalograph was taken during a WM task, which was an automated operation span test before and after SKY with 90 days intervals. No SKY was given to the control group. Statistical Analysis Used: t-test and one-way ANOVA were applied. Results: SKY promoted the efficient use of energy and power spectral density (PSD) for different brain rhythms in the desired locations as depicted by the gamma (F8 channel), alpha, and theta 2 (F7 and FC5) bands. It was found that gamma PSD reduced for both phases of memory in the experimental group. Alpha energy increased during the retrieval phase in the experimental group after SKY. Theta 1 rhythm was not affected by SKY, but theta 2 had shown left hemispheric activation. 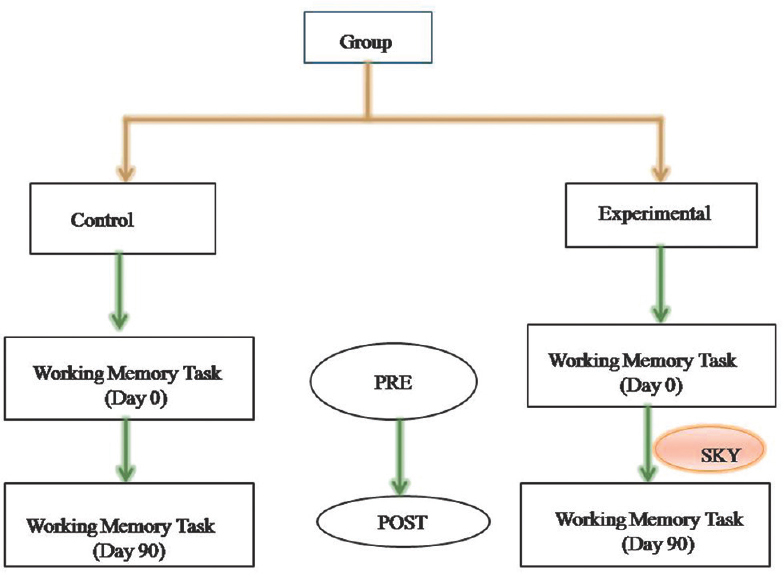 Theta rhythm was associated with memory consolidation. Conclusions: SKY had shown minimized energy losses while performing the task. SKY can improve WMC by changing the brain rhythms such that energy is utilized efficiently in performing the task. Context: A popular form of pregnancy physical activity (PA) is prenatal yoga. However, little is known about the intensity and energy cost of this practice. Aims: To examine the energy cost and intensity level of prenatal yoga. Methods: Pregnant women in a prenatal yoga class (n = 19) wore a Sense Wear Armband during eleven 60 min classes each, and self-reported demographic variables, height and weight, prepregnancy weight, and PA behaviors and beliefs. Sense Wear Armband data included kilocalories, metabolic equivalent (MET) values, and time spent in various intensities. Descriptive statistics and frequencies were utilized to describe energy expenditure and intensity. Results: Energy expenditure averaged 109 ± 8 kcals, and the average MET value was 1.5 ± 0.02. On average, 93% and 7% of classes were sedentary and moderate intensity PA, respectively. Conclusions: Time spent in a prenatal yoga class was considered to be primarily a sedentary activity. Future research should utilize larger samples, practice type, and skill level to increase generalizability. This case focused on a 7-year-old boy with Apert and Asperger's syndrome who attended 8, 45 min multisensory yoga sessions, twice a week, during 4-week camp. Results from the pre- and post-tests on Treatment and Research Institute for Autism Social Skills Assessment showed improvements in the total score changes from 19 to 7 for disruptive behaviors. Sparks Target Behavior Checklist scores changed from eight to one showing progression in ability to stay on task. Yoga Pose Rating Scale displayed the transformation in total scores from 80 = emerging to 115 = consistency in pose performance. The field notes revealed the positive development in expressive emotions, social engagement, and decline in looking around. Outside class parent and school behavioral specialist reported the improved ability to self-regulate stress using lion's breath and super brain. These findings indicate an improvement in behaviors that influenced the physical performance, emotional expression, and social interaction after yoga training for this child.